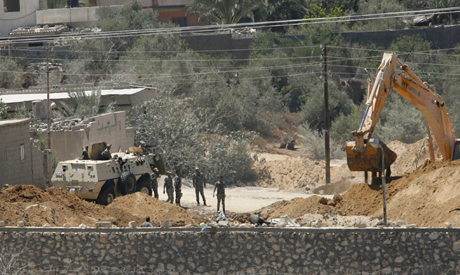 The situation in Egypt's Sinai Peninsula remains tense. For now, the army seems to have slowed down its advance on alleged terrorist hangouts, pending negotiations with army chiefs. But the political overtones of the security dilemma are becoming harder to decipher. For one thing, the government is using non-official negotiators to talk to Sinai's militants, something that provoked the ire of Sinai activists who scorn the idea of those they consider extremists having an impact through talks on matters of national consequence. Also, no one knows exactly how much of the blame should be placed at the doorstep of the Hamas government of Gaza. According to Ramallah-based officials, it is all the fault of Hamas, whose agents have gained a lot of clout in Sinai in recent years. The claim is strenously denied by Hamas officials, however, who say that they would never take action to harm Egypt. Indeed, since the election of Islamist-leaning Mohamed Morsi to Egypt's presidency, Hamas has a clear stake in humouring, rather than antagonising, the Egyptian authorities. For now, it is a mixed bag of actions and reactions, claims and counterclaims. To underline the graveness of the situation, Army Chief of Staff Lieutenant General Sobhi Sidqi met during his recent Sinai visit with tribal chieftains, hoping to get them on the side of the army in any future operation, or perhaps to cooperate more with the intelligence services. President Morsi lent vehicles belonging to his office to a group of mediators, including well-known Islamists, to go to Sinai and try to talk sense into the militants. Preparations are underway for a meeting in Cairo this week, during which an initiative for ending the violence may be hammered out. Critics of the recent wave of government-led diplomacy want the government to find other ways of imposing law and order, however, aside from cajoling suspected members of violent groups. Ashraf Al-Hefni, of the Revolutionary Socialists movement, said: "The affiliation of the men currently involved in the negotiations is well known. It would have been more advisable for the government to prosecute those who embrace jihadist thinking instead of talking to them and trying to influence their thinking. There are some families in Sinai who have lost sons because of the violence." Al-Hefni said that the government has to pick its enemies. "We will support the government if it takes action against extremism and its manifestations," he said. According to Sinai activist Mosaad Abu Fajr, the government is still using the same heavy-handed tactics of the past, while failing to address the core of the problem. "In 2007, we fought hard for the State Security chiefs to be replaced. The State Security policies were lethal and murderous. And today, these same chiefs are coming back to Sinai and implementing the same old policies," Abu Fajr stated. He added: "Even after the ouster of the regime of repression, we're back to square one – if not worse. In the past, security was handled by the Ministry of Interior. Now the government is bringing in the army, which should be the last resort." Abu Fajr's main concern is that the real problems are not being addressed. The current mediators, sent or sanctioned by the government, are holding talks with violent groups that dream of an Islamic state in Sinai, he said. "This is an expression of failure. The state is not being defeated by social forces with a different political approach. It is being defeated by groups involved in violence," Abu Fajr asserted. According to Abu Fajr, the government is not yet addressing the fact that Sinai was never fully integrated into the rest of the country. "What is hampering security in Sinai is not the Camp David accords, or the security addendum of the peace treaty. What is hampering security in Sinai is the lack of political imagination ... Shall we address Sinai with the imagination of Nelson Mandela? Should we forget about the mindsets of Abdel-Nasser, Mubarak, and Morsi, and think instead outside the box? Unless we do that, we may lose Sinai forever," he posited. But the army doesn't seem to be listening to its critics. It has, however, been talking to the Israelis, the Bedouins and the Palestinians. It has also slowed down, if only temporarily, 'Operation Eagle,' the codename for the military campaign to eradicate terrorist hangouts in mountainous areas. A source from Al-Halal Mountain, allegedly a prime militant stronghold, says there is no security presence on the part of the army, nor are there military operations going on at the moment. Squads of police, army, and intelligence services have continued, however, to search for suspects in the areas around Rafah, Sheikh Zoweid and Al-Arish, according to Sinai lawyer and activist Islam Kodeir. Several suspects, including Palestinians, have been arrested. And images found on their phones were said to connect them with the Rafah incidents. The suspects are currently being interrogated. Meanwhile, forensic examiners are expected to submit their analysis of the DNA of some of the perpetrators of the Rafah attack soon. Positive identification of the attackers will help the police pinpoint the groups that planned the operation. Military expert Talaat Mosallam said that Operation Eagle has been a success in more ways than one. For example, the mere presence of the army helped track down some terrorist cells, even if by sheer coincidence. The operation has also blocked trafficking lanes and shut down many of the tunnels that were used to smuggle arms and drugs to and from Gaza. "From the military point of view, the operation is not supposed to branch out in all directions. It must be carried out, but it must remain surgical in nature," Mosallam pointed out. The Palestinian angle is one of the trickiest in the current investigation. When the investigation began, Hamas emerged as a prime suspect. But now, Hamas officials are denying any involvement, not only on their part, but on the part of any groups based in Gaza or having links with the Gaza government. A Palestinian delegation from Gaza has met in Cairo with senior military chiefs, Hamas security official Mahmoud Al-Zahar said. According to Al-Zahar, the delegation offered evidence to refute claims of Hamas involvement. The claims, he maintained, were fabricated by Hamas' rivals in Ramallah, who are trying to tarnish the group's image and spoil its relations with Cairo. According to Egyptian military sources, several Palestinians, as well as men of other nationalities, were involved in the recent wave of violence in Sinai. One of the men whose names has come up in the media was Momtaz Daghmash, a co-founder of the Army of Islam. According to Al-Zahar, Hamas interrogated Daghmash and other militants and found no evidence of their involvement. "We have established that they were not involved. Some of them swore that they weren't involved in any way. Names of people from the resistance in Rafah were on the list [that Ramallah gave Cairo]. They are part of the movement. How can they be implicated? They are answerable to the resistance and cannot make a move without its permission," Al-Zahar said. The most convincing part of Al-Zahar's argument is that Hamas had nothing to gain by alienating Egypt's Islamist government, which is known to be sympathetic to Hamas's cause. "The relation between Hamas and Cairo has improved so much that we now have [Egyptian] recognition of the status quo on Gaza. It is impossible, therefore, for any group [loyal to Hamas] to be implicated in an incident of this type," Al-Zahar added. Hamas officials intend to meet President Morsi this week to explain the situation. Egyptian sources are sceptical about Al-Zahar's claims that Hamas was not involved in the Sinai attacks, arguing that Hamas couldn't have been unaware of terrorist plans in Sinai. Al-Zahar admitted that Hamas is keeping tabs on groups working in Sinai. But for him, this rules out the possibility that any of these groups had been involved in the recent attack. "We have security control of various groups, not a hands-on approach, but through agreement and understanding. We keep an eye on the splinters and the doctrinally skewed. We watch them all the time," he said. In July, President Morsi and Ismail Haniya, prime minister of the Hamas-run government in Gaza, met in Cairo and "examined easing restrictions on residents of the Palestinian enclave," according to Morsi's spokesman. Haniya's visit to Cairo, the second by a top-ranking Hamas official since Morsi's election, came after the newly-elected president's meeting with Mahmoud Abbas, president of the Palestinian Authority, and Hamas chief Khaled Meshaal. Prior to the meeting, Haniya hailed the meeting as the "fruits of the revolution" that overthrew Egyptian strongman Hosni Mubarak early last year. However, after the meeting, Haniya did not issue any statements concerning the meeting's outcome. An Egyptian source who attended the get-together, but preferred to remain anonymous, stated that Hamas was "asking Egypt for more than it can offer." "They want all the rights that Egyptian citizens have," he said. "Their demands cannot be met, even under the current administration." According to the source, Hamas also wants to keep some of the tunnels open, even after the Rafah border crossing is re-opened to both people and goods, arguing they need a plan B in case the crossing is attacked by Israel. "But Egypt's policy is that, in order to open the Rafah border crossing, all tunnels must be closed," the source stressed. "If an alternative is required, the Egyptian government will oversee any other arrangements." As part of Operation Eagle, the army has brought in some types of hardware that are not permitted in certain areas of Sinai under the security addendum of the Egypt-Israel peace treaty. When the Israelis protested, army officials got in touch with them, and arrangements were made to satisfy both sides. "There has been an implicit agreement since the beginning [between Egypt and Israel]... When [Israeli] protests mounted, defence ministers Al-Sisi and Barak had a discussion during which they agreed on the target of the operation and that it won't threaten Israel in any way," a military source said. Reacting to accusations that the army was failing in its mission, the source said that Operation Eagle had achieved several "notable successes." "We have to look at the accomplishments on the ground, at the fact that the tunnels were demolished and the arms dealers, the splinter groups, and the terrorist hotspots were held at bay. We now have lists and maps of everything, from houses that were used as fronts to run underground tunnels to depots used for arms, drugs and human trafficking," the source said. Some say the Egyptian army is trying to gain some de facto privileges in Sinai, regarding its manner of deployment and the levels of armament. Others say it is unlikely that Tel Aviv would agree, except temporarily, to any alteration in the Sinai deployment situation. Said Okasha, an analyst with Al-Ahram Centre for Political and Strategic Studies, said that what the Egyptian army is doing now is no more than what Israel did in the past. "Following the January 25 Revolution, reports spoke of Israel infiltrating Zone D. Israeli forces dealt with Zone D as a security belt and set up rapid-deployment units there, helped by the fact that there was little or no Egyptian security there at the time. Perhaps this was justifiable then, but not anymore," Okasha remarked. An Egyptian military source denied any significant breaches by Israel of Egypt's borders. Apart from a flight by a pilotless plane, Israel has not infiltrated Zone D in recent weeks, he said. The source added that Egyptians and Israelis were "in constant touch" to ensure such incidents will not be repeated. They are not terrorists; but multi-million dollars smugglers of Iran/Hamas opion from Afghanistan. Egypt should develop new strategy other than military force; it will not work as in US and other countries. The past infamous regime knew about it and let it grow for profit. Aladin open up and eligthen yourself, your obsession with Iran/Hamas make you a shallow analyst and a hypocrit. Israel have the biggest organ traficking and drug smugling in the World. Hamas is just a polical and stateless representative of a poo open prison of refugees, under the thumb of the most powefull country that also in controles powerfull U.S. You're a despicable racist: Bala Sharf.